-Death waits, perched on the horizon, all leads to the inevitable void. Violent anti-human Black Metal, highly recommended! -Pungent as the stench of rotting flesh and supercharged with vitriol, this album exudes the reek of authentic, uncontrolled blasphemous decadence. -If you need a description you don't need it. -Back in stock! Blasphemous Black Metal elite from Finland serves us an incredible opus dedicated to pure evil. -Death Industrial/Noise Ambiant meet Harsh Noise/Power Electronics. -Spears flung from the cosmos clenched fist. Hate from a forsaken star. The righteous stand as ash. Blood soaked, Victory rains down. -Doomy and obscure Black Metal, four haunting tracks of theistic Satanism, death worship and invocation of spirits unknown. -Always expect the unexpected from this Finnish duo. Armon Keitaalla is pure bliss. Absolutely essential! -Depressive Black Metal from Canada. -La France que vous detestez, highest recommendation... especially if you understand French! -Heathen Black Metal from Hellas, this release is including both splits on a single cassette. -Heathen Black Metal from Hellas, this release is gathering all their demos on a single cassette. -A complete statement of stoic but shimmering melodic Black Metal with expressive vocals. -Crushing, slow motion avant ultra Doom. Sludgey, blackened and insanely heavy. -Black Metal at its finest, with heavy emphasis on gritty, cyclic riffing. -Compiling a split LP of elder, eldritch demos as well as a cancerous split 7", both bands paint a fatal portrait. -Their typical raw Black Metal style combined with some old-school touches. 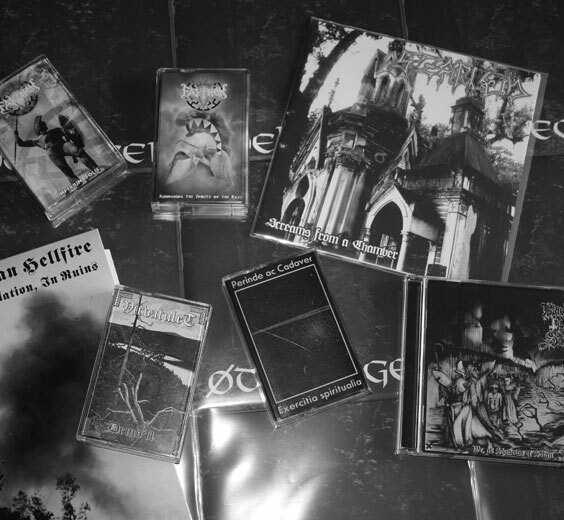 -Collects rare and unreleased material from the Finnish Black Metal leader’s classic "Envaatnags Eflos Solf Esgantaavne" era. -Haunting and ghostly Black Metal. -After many delays this masterpiece is finally out, atmospheric Black Metal from Poland. -Elite Pagan Black Metal from Poland. -Progressive song constructs coil inward and outward upon themselves in acts of occult alchemy, exploring labyrinths of the soul few have the resolve to embark upon. -Raw, ugly and primitive German Black Metal united on black vinyl. Highly recommended! -Reissue of the first Pagan Hellfire album originally released back in 2000, highly recommended! -Reissue of the second album of the best Black Metal band from eastern Canada. -Epic Black Metal with powerful melodies and spirit, highly recommended! -Astral electronic Death Ambient that willlead you into total isolation, highly recommended. -Raw German Black Metal a bit influenced by the primitive aura of Von. -One of the forerunners of Finnish Black Metal is here again with more tormented tunes for the soul. -Bloodcurdling passion with an Imperial command of the essence of Black Metal. -Killer bleak, depressing funeral Doom Metal with a blackened edge. -Raw German Black Metal , nothing more nothing less. -Raw Heathen Black Metal from Finland.